Mark's Tickets is the best place to find tickets for Detroit Red Wings fans. Just check this page for any new events or schedule updates throughout the year. We sell tickets to every Detroit Red Wings game around the world. We know how passionate Detroit Red Wings fans can be about hockey, so we make sure to have hundreds of tickets for every game available right up until it starts. For those looking for cheap Detroit Red Wings tickets, we offer tickets starting at very low prices (many times below face value). 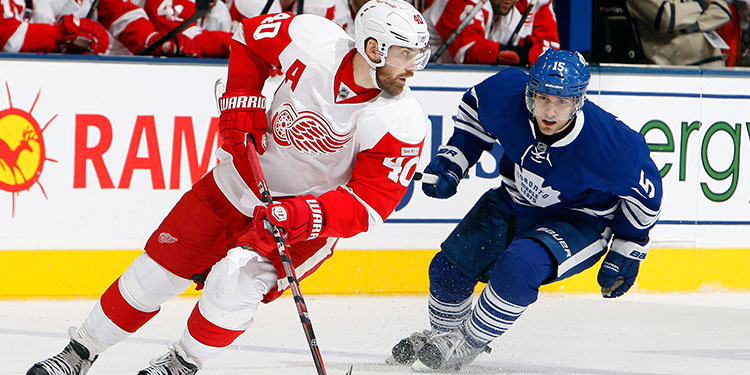 We offer tickets in most sections of every venue that you can see Detroit Red Wings. Simply choose the city or venue that you are interested in below, and you will be able to see all of the available seats. Do not forget that Marks Tickets also specializes in sold out Detroit Red Wings tickets. No longer will sold out shows prevent you from seeing Detroit Red Wings. The Detroit Red Wings are a professional hockey team that plays in the NHL. The Red Wings play their home games at Joe Louis Arena in Detroit, Michigan. With 82 games per year, and 41 being home games, The Detroit Red Wings are a professional ice hockey team based in Detroit, Michigan. They are members of the Atlantic Division of the Eastern Conference of the National Hockey League (NHL), and are one of the Original Six teams of the NHL, along with the Toronto Maple Leafs, Montreal Canadiens, New York Rangers, Boston Bruins, and Chicago Blackhawks. As of 2011, the Red Wings have won the most Stanley Cup championships (11) of any NHL franchise based in the United States, and are third overall in total NHL championships, behind the Montreal Canadiens (24) and Toronto Maple Leafs (13). They play home games in the 20,066 capacity Joe Louis Arena after having spent over 40 years playing in Olympia Stadium. The Red Wings are one of the most popular franchises in the NHL, and fans and commentators refer to Detroit and its surrounding areas as "Hockeytown", which has been a registered trademark owned by the franchise since 1996. Between the 1933–34 and 1965–66 seasons, the Red Wings missed the playoffs only four times. Between the 1966–67 and 1990–91 seasons, the Red Wings made the playoffs only eight times in 25 seasons. During the last 11 years of this stretch, only five of the league's 21 teams did not make the postseason, yet the Wings still managed to miss the playoffs five times. This rough period for the team provoked the nickname of the "Dead Wings." Near the end of that 25-year period, however, the Red Wings advanced to the conference finals twice. Since then the Red Wings have been one of the most successful NHL teams in the last quarter century, with six regular season first place finishes, and winning the Stanley Cup four times from six Finals appearances. They have made the playoffs in 27 of the last 29 seasons; their playoff streak currently stands at 22 in a row (1991–2013), which is the longest current streak of post-season appearances in all of North American professional sports.